I have long, highlighted blond hair that can be a challenge to keep looking healthy. As an eco-conscious woman, I have tried numerous naturally derived brands in the past but found myself returning to my previous brand products despite being worried about the potentially harmful chemical ingredients because the other brands just didn’t work for my hair in terms of cleansing, conditioning and styling. Thankfully, I can have the best of both worlds with Boo Bamboo™ i.e. a naturally derived hair care line that works very effectively for my hair. 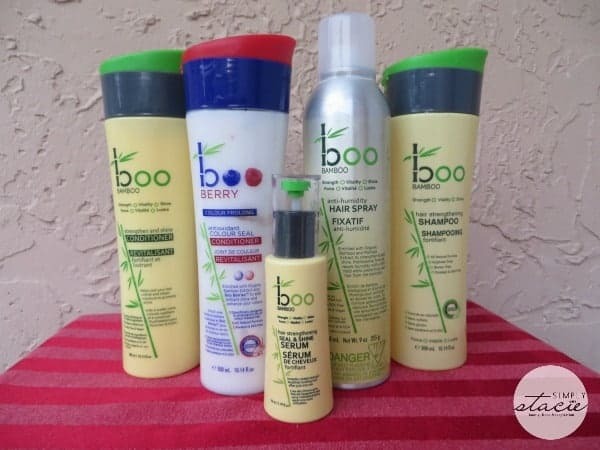 Boo Bamboo™ has a full collection of skin and hair care products that use naturally derived ingredients such as certified organic bamboo extracts, mineral and organic proteins and more. In fact, this hair care company is proud to report that this product line can “strengthen hair up to 5x and creates angelic shine”. While I can promise that I look like an angel…..I can tell you that my hair is looking shinier, feels softer and styles beautifully when using Boo Bamboo™ products! What I appreciate the most is that it uses high quality naturally derived ingredients without sulphates, parabens or DEA! If you have color treated hair like I do, then you need a really good hair care product line. From my recent personal experience I highly recommend the new Organic Bamboo Extract and Boo Berries™ Shampoo and Conditioner. The biggest problem that I have with my hair is that I live in humid Florida so I am constantly battling frizz. This luxurious shampoo and conditioner uses protein and silica to add shine back into my hair and I couldn’t believe how easy it was to comb through after washing and conditioning when using this duo. I can honestly say that it was the best natural conditioner that I have ever used on my color treated hair! My husband and children love using the Boo Bamboo Hair Strengthening Shampoo and Conditioner. They have been swimming in the pool again for several months and normally by now their hair would be showing signs of damage from the chlorine. They have been using this product for several weeks and their hair still looks great. I can feel good that not only do they look good but they are not using products loaded with chemical additives. For styling, I was particularly impressed with the Boo Bamboo Hair Spray that is specifically created for humid environments. It doesn’t get much more humid than Florida and sometimes I can actually feel my hair expanding in a frizzy mess within minutes of going outside. I recently had to attend a special event and straightened my hair using this styling spray to lock my hair in place. It did a great job and I really liked that that it was not sticky, I didn’t have helmet head and I could comb through it! The Boo Shine Serum is absolutely brilliant as it adds shine and makes fly away pieces of hair more manageable without it becoming greasy or noticeable build up. This product is really like magic for my dry, frizzy hair! Boo Bamboo has products for skin too. I recently went on a camping trip and thought that the Bamboo Makeup Remover Wipes would be easy to use and I was right. These effective wipes come 25 in a pack and are made with 100% unbleached bamboo. It left my face feeling clean and refreshed. I don’t wear much makeup when camping but I do use a long lasting tinted lip stick. One wipe actually removed it at the end of the day! I would love to try the anti humidity hair spray. I would really love to try their skin care line especially the facial wash! Thank you for the wonderful giveaway! Would love to try. I would totally love to try their makeup remover wipes! I would like to try the Boo Bamboo Frizz Control Curl Defining Gel. I would love to try SPF 30 Sunscreen Lotion. I have color treated hair and I would love to treat it to the Boo Bamboo Hair Shampoo and Conditioner.This sounds like heaven to me to get my hair back in shape!! I’d love to try the Line Lifting Face Cream. I would love to try the Makeup Remover wipes. I would love to try the shampoo!! I would like to try their makeup remover wipes! I’d like to try the Line Lifting Face Cream.